Last Date To Apply Online For HAL India Recruitment Today! What Next? Last Date To Apply Online For HAL India Recruitment Today! What Next? Yes, within a few hours link to apply online for Hindustan Aeronautics Limited India Recruitment 2018 will die out. Further which, all appeared candidates will be left with nothing but a wait for the release of official merit list PDF on an authorised portal. Respectively, there are 05, 04, 01, 02, 14 and 35 vacancies online for Computer Science, Information Technology, Civil Engineering, Electrical Engineering, Mechanical Engineering and Electronics Engineering disciplines. 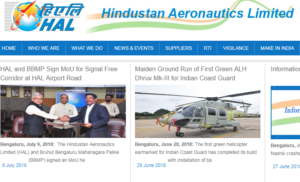 HAL Notification was released online on 7th July 2018 with online registration started from the same day. Besides, HAL Apprentice Application Form 2018 last date is 27th July 2018. In accordance with major details available in the official notification, no written examination will be held as a part of a selection procedure. But, in this direct recruitment, Board of Controller of Examinations, HAL India will release final merit list after scrutinizing eligibility and document verification procedure. Regarding conversion of aggregate marks in percentage a certificate from institute/ board/ university wherever SPI/ CPI/ DGPA/ CGPA is mentioned. Certificate and Marksheet for all semesters for Diploma, High School, Intermediate etc. No precise application form format has been made available regarding user registration. Rather, all job volunteers will have to send the required details @ [email protected] (authoritatively verified e-mail). In fact, HAL is not responsible to provide any employment. But just an Apprenticeship Training will be provided to the candidates and after the duration is exhausted, the contract will be terminated. As mentioned in the official notification PDF, there are 61 vacancies in total for Apprentice Trainee post. www.allindiaroundup.com will keep you updated and fresh about other latest news and release of Merit List PDF or Result PDF on official website www.hal-india.com from time to time. Thus, make sure to remain in touch and don’t forget to visit us on regular basis.